Once again, PCS has been invited to exhibit work in the beautiful gallery spaces of the Medford Leas Art Center where audiences will gather for orchestra, ballet, and opera performances scheduled this year during the month of December. This is a much larger audience for our work than we usually have and we’re hoping to display at least 60 pieces by members of the Society. We have experienced exceptional sales at this show in the past and Medford Leas charges no commission, so you get the full price if your piece sells. If you are not familiar with this organization, Medford Leas is a huge Quaker community that attracts visitors from all over Pennsylvania, New Jersey, New York, and Delaware. Its campus includes everything from individual homes and townhouses to continuing care facilities, and features a cultural arts center and an arboretum. Medford Leas provides year-round programs for their highly-educated residents as well as the outside community. We are fortunate to be welcomed by this culturally active organization that enthusiastically promotes their programs and exhibits. 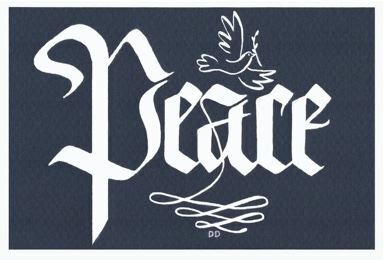 To provide focus for this exhibit, we have chosen the theme PEACE, which can be interpreted in many ways, including the traditional holiday wish. You have more than a month to challenge yourself to create at least one piece for this show. This is a non-juried exhibit open to all current PCS members. There will be an area for new students to showcase their work, so beginners as well as seasoned calligraphers are strongly encouraged to enter. Since Medford Leas is generously offering their gallery space to us at no charge, there will be no fee for entering pieces in this show. Work must be framed gallery style (no saw-tooth hangers, only wire) and must be designed to hang on the wall, as there are no cases. While it’s not necessary to use the word “peace” in your work, the theme necessitates at least a peaceful sentiment be expressed. During the month we will offer a mini workshop there and need volunteers for this activity when it’s scheduled. We also need volunteers to help set up and break down the exhibit. For insurance purposes, we need a list of artwork that will be in the exhibit. Please let Maureen Peters know the title, medium, and value of your entry by November 24, so that labels can be made. Installation of the show: Sunday, December 2. Work should be delivered to any board member before Thanksgiving or to Maureen on December 2 by noon at Medford Leas. Opening reception: Tuesday, December 4, at 3 pm. Breakdown of the show: Tuesday, January 1, 2019 at 1 pm. Artwork cannot be removed before the end of the exhibit. Sold pieces will be available after the show comes down.